Choosing the bridal bouquet is one of the hardest tasks of the bride when organising her wedding day. It is the starting point of the wedding flowers and defines the bride's style and character. Neill shares experience, skills and historical references to help brides choose their perfect bouquet. A wedding ceremony may be the only time in a woman’s life when the way she looks and feels is closely identified with the flowers she holds. At first the flowers might seem the most fleeting part of the ceremony but when the music starts and we catch a first glimpse of the bride on the arm of her father or friends, her flowers literally precede her. Choosing a bouquet therefore is the sum of many parts. It should complement the dress, echo the theme of the decorations as a whole and be chosen for symbolic reasons. Brides in Ancient Greece carried herbs that were thought to repel bad sprits and in Elizabethan times, brides often held garlic and chives for the same evil-dispersing reasons. In the Victorian era, brides designed their bouquets to send messages in ‘the language of flowers’. Why not spell ‘love’ with Lilac, Orange blossom, Verbena and Euonymus? Note the size and shape of this White Avalanche Rose bouquet. It's important that the bouquet doesn't overwhelm a delicate figure or seem too small for a tall bride. White prevails as the most popular choice of bridal bouquet – Queen Victoria displayed her preference for lack of ostentation by carrying a bouquet of simple white snowdrops and wearing orange blossoms entwined with diamonds in her hair. Meanwhile, the classic nosegay bouquet of Lily of the Valley, shown here, is composed of hundreds of the nodding bells of the fragrant flower, nestled among their own luscious green leaves. This was the choice of Princess Kate Duchess of Cambridge, Princess Grace of Monaco as well as Princess Margaret and her daughter-in-law Viscountess Linley and we have made several bouquets, inspired by and in homage to these royal brides. Designing a bouquet can require delicate and elaborate technical skill and at Neill Strain Floral Couture we pride ourselves on our bespoke arrangements which we make with infinite care – weaving a wire lacework as the background and frame to many of our bouquets. 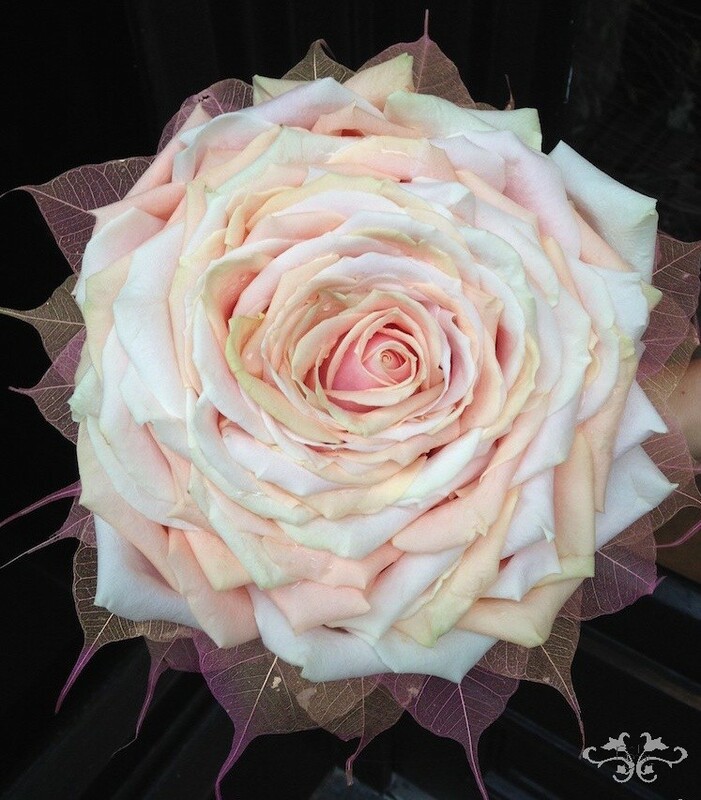 This is particularly effective should a bride choose the dramatic splendour of a Carmen Rose. The impressive size of the Carmen Rose bouquet is obtained by carefully adding layers of additional petals of the same flower beyond the edge of the original flower. 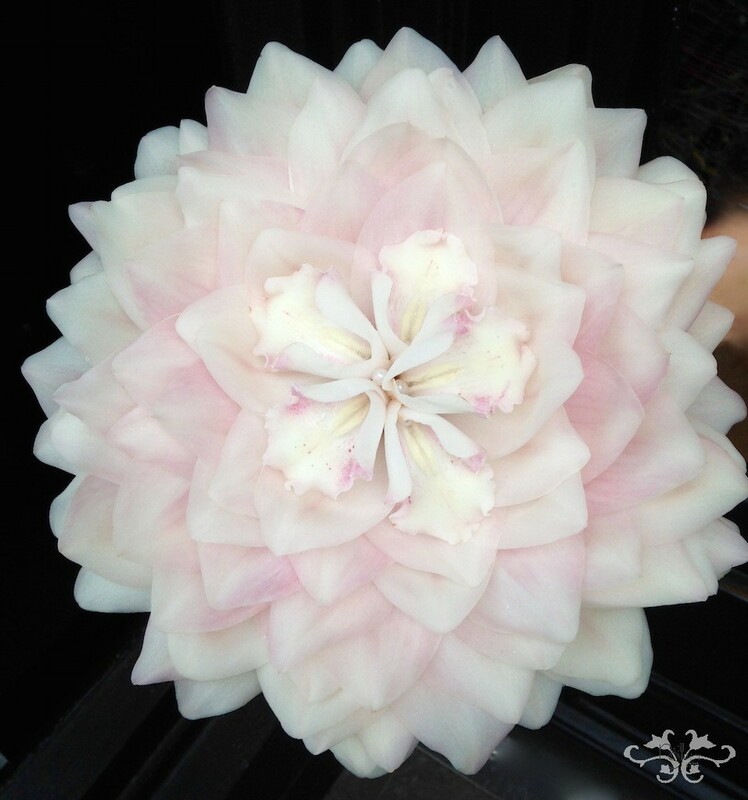 Also known as a Composite Flower or Glamelia, the same effect can be created with other flowers such as Cymbidium Orchids or Lilies. A formal gown calls for a more structured bouquet, perhaps Roses and/or Phalaenopsis Orchids with a ribbon or wire cascade. The gown sets the mood while the bouquet can underscore it. The colour of a bridal bouquet has usually been white or the palest pastels, but now nearly any hue is suitable. Flowers can be the sole note of colour – like this bouquet of White Phalaenopsis Orchids with Pearl Avalanche and spray Roses combined with pearls and delicate golden wires. The orange hue is designed to stand out against the white wedding gown while the gold wire and berries harmonise with the gown's gold embellishments. Carefully selected arrangements can complement a pastel-coloured gown. An array of pink Roses with berries and foliage enhanced this dusty pink gown, beautifully displayed in one of our wire and bead creations. This unusual indigo-coloured wedding gown demanded a dramatic and original bouquet composed in this instance from a variety of foliage, Orchids and Succulents. And here are two equally dramatic alternatives that we created for the indigo taffeta dress. One Biedermeier-shaped Bouquet with spring flowers and ferns, one Cascading Bouquet of Roses, Vanda Orchids with trails of Hyacinth flowers, rolled Rose petals and Amaranthus. The effect of a bias-cut dress can be heightened with Calla Lilies bound in a tailored sash, while tulle might call for Lilacs and Hydrangeas. A Cone Bouquet was once a favourite for bridesmaids and flower girls and is now also appealing to the modern bride. For Autumnal weddings, brides often ask for bouquets composed in rich, jewel-toned Roses such as Black Magic, Red Devil and Black Beauty. These Roses can be surrounded by velvety Cosmos for a textural sensation or punctuated with lavender Roses and Hydrangeas, nestled amongst foliage for added texture and elegance. For a recent autumn bride, we were inspired to make a hand-held pomander with wired flowers and accessories. Small and delicate as the bride was quite petite. Frames for bridal bouquets can be made not only of wire, but of any natural or man-made material. Wool gives a rich texture for the winter bride. In this bouquet we repeated the woolly texture with the yellow Gloriosa Lilies and green Celosia flowers. Flowers may be chosen for personal or historical significance and if a bride is unsure about what she wants, I always ask about floral memories as a starting point during our consultations. Seasonal availability may also be a factor, but the choice of wedding flower should ultimately reflect affinities, hopes and memories. And when it comes to the wedding day itself I usually find that a bouquet steadies any nerves and trembling hands while its scent will linger in the bride’s memory long after the ceremony is over.